When you go bareboating with Whitsunday Escape, we provide snorkelling gear free of charge! You will get mask, fins and snorkel for every person on board. You’ll even get to select your correct sizes, when you pick up your gear from the dive shop underneath our check-in office. 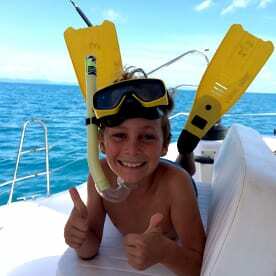 HOT TIP: If you are collecting snorkelling equipment for a crew member who is not present, find out their shoe size to ensure you get the right size fins. Across the top of Hook Island there is a series of bays that all offer excellent quality snorkelling with beautiful healthy coral and diverse marine life. There is a resident Giant Maori Wrasse up in this area that cruises along the bays curiously checking out the snorkelers and divers. Well protected from southerly winds, Butterfly Bay offers some surprisingly good snorkelling. Snorkel the eastern walls of both halves of the bay. The northern beach near anchorage 2 is also an actual butterfly haven in the cooler months. Rumour has it there is a family of clown fish living on the little reef between the two beaches on the shore here. More moorings here than at Maureens, Manta Ray or Pinnacles means you’re more likely to get a spot here. Take the dinghy and explore the other bays. The best spot to explore underwater here is the eastern wall of the cove. Reputedly some of the best underwater scenery to snorkel in the Whitsundays. Just a day spot, and only in light conditions. When you tire of the amazing coral, go ashore at Pinnacles and carefully explore the former lighthouse area. One of the most popular spots for snorkelling and with good reason. There is a coral beach here to go ashore, and some interesting little nooks and caves to explore in the water. Another very popular spot to snorkel, the fish life here is quite diverse. Watch out for the cheeky batfish who like to come right up close! They won’t hurt. They are flat, are about the size of a dinner plate and very curious! This is a surprisingly good spot to visit if the conditions are nice and light. There is an abundance of Christmas Tree Worms near the shore, and very diverse fish life. You might find Nemo or Dory here! The reef here is seldom visited by the bigger boats, and is very rich and diverse. On a rising tide you can take your dinghy in to the little beach here and walk straight in from the shore, just don’t get caught out at low tide! There are a few colonies of clown fish that live here, and sometimes turtles stop by. This spot is beautiful, with a long sand cay to explore on foot. There is plenty of sea grass in this area, which is a favourite food for sea turtles! You might get to snorkel with turtles at Langford Island. When the tide is low, and the conditions are nice and calm, you can snorkel the length of reef on Haselwood Island from Katie’s Cove, past Honeymoon Island to Chalkie’s Beach. From the beautiful white sandy beach extends a ridge of pristine coral reef. See how many different types of coral you can name. Want to go snorkelling in the Whitsundays? Book a bareboat with Whitsunday Escape to snorkel the Whitsunday islands at your own pace. Need help working out which boat will suit your group and level of experience? Contact our friendly reservations team for a recommendation.